ESPAÑOL The North Side of Amboro National Park is an area that, despite its proximity to the city of Santa Cruz, receives very few visitors. Nearly all tourism in the northern area of the Amboro preserve takes place within 3 kilometers inside what is called the "red line". This line separates the park's Natural Area of Integral Management (ANMI) from the heart of the park itself, which covers nearly 400,000 hectares of land. 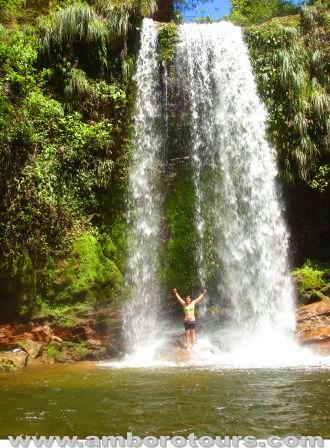 The northern portion of Amboro National Park consists of rainforest, Amazon river basin, waterfalls, natural pools, and many rivers and streams. 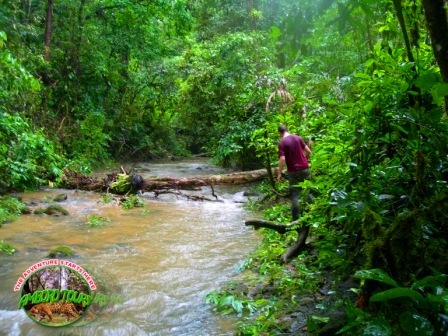 Comparing the vegetation of this area with that of the jungles of Noel Kempff or Madidi National Parks in Bolivia, and especially in the southern side of Amboro, the difference is plain to see, especially because of the rainforest which gives life to very distinct species of trees and ivy. But what most draws visitors' attention is the general quality of the jungle. It is very dense and much taller than in other similar places. Although Amboro National Park is well known for its many different types of birds, they are easy to hear but very difficult to see. 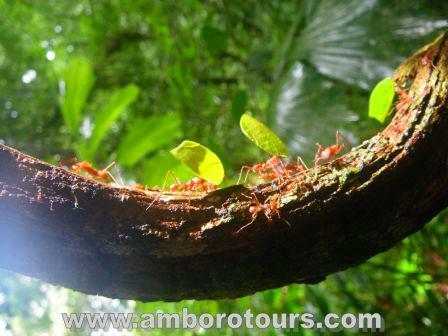 This part of Amboro is rich in animal life and contains a great number of species native to the Amazon region. All of this provides for a spectacular Amazon experience for visitors. The southern zone of Amboro National Park is the high part of this protected area. It is a mountainous area and access inside or passing the Red Line is much more difficulta than on the North Side. This area is where the spectacled bear (Trematus ornatus - we call it a Jucumary) makes its habitat, as do other types of animals. Another great difference between this and the North Side is that here there are fewer rivers and streams and it is less humid than the North Side. Vegetation is less dense, trees are not as tall, and wildlife species vary. Lodges are surrounded by immense vegetation-covered reddish mountains.